Connecting donors with the issues that concern the community. 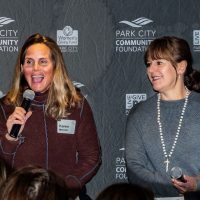 In 2017, the Crest Speaker Series was created to thank Park City Community Foundation supporters. The goal is to build a community and introduce philanthropists to one another. Over the span of a year, members enjoy events that include engaging and interesting speakers, relevant, topical issues, and unique and fun activities in the intimate setting of private homes. In addition, these close friends of Park City Community Foundation have the opportunity to stay updated on current programs and initiatives. The signature Crest Speaker Series is open to Pinnacle, Apex, Summit, and Crest level donors, as well as special invited guests. 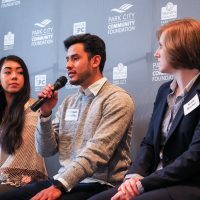 “Dare to Dream” a discussion with young Parkites Enrique Sanchez and Dalia Gonzalez surrounding DACA and immigration in Park City. Interested in joining at a Crest Level? Give online or email Sam Mueller at sam@parkcitycf.org.